Suckers, a Freaky Little Musical, Zombie Productions, Orlando. Green venue, 60 minutes, $10. The first edition of Tod Kimbro’s Suckers, staged way back in 1998, is one of those Fringe shows that have stuck with me — outrageous, funny and a whole lot sweeter than you’d ever expect it to be. It may have taken them 13 years, but now Kimbro and director Michael Marinaccio have one-upped themselves: Their musical version of Suckers — still funny and insightful and considerably more polished — works even better at bringing a passel of Goth kids and their identity crises to life. 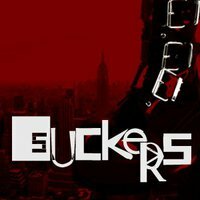 Set, of course, in the mid-1990s, Suckers centers on the kinds of kids you’d scurry away from at the mall — all of them dressed in black, with major eyeliner, major piercings and major disdain for the world. The mysteriously eastern-European Smegva (Erin Brenna) still spouts poetry at the Caffeine Crash (“Death, death, ja, baby, dig it”), and waiflike Violet (Jessi Riese) still waits forlornly outside Club Flambé because she doesn’t have the cash to get in. Kimbro has added half a dozen or so witty songs (I only wish the volume was turned down a little so I could understand more of the lyrics), and Marinaccio’s seven-member cast (which also features Sam Little, Josh Roth, Corey Volence, Kimbro himself and Rob Vandevier) is comical and even touching. Marinaccio stood in admirably for Little at the performance I saw, and I especially liked Brenna’s red, sparkly eye shadow, which gives her a perpetual look of red-eye; Volence’s manic energy and Roth’s deadpan demeanor. (“Hi, Violet,” says his character Louis, morosely. “You sound morose.”) Suckers may not send you out to the mall for a couple of lip piercings. But it’ll help you appreciate — and even love — the kids who are already there. Sunday May 22, 7:40 p.m.
Monday May 23, 11 p.m.
Thursday May 26, 6 p.m.
Friday May 27, 9:50 p.m.
Saturday May 28, 1:15 p.m.
Sunday May 29, 2:55 p.m.